Syed Hussain is sixty but his nationality and citizenship are disputed. An unfortunate man, who lost his parents in childhood, was actually brought up by a Sikh whose death in Iran took him to Bangladesh. There, he married a Burmese. Finally, he returned home to Jammu via illegally and was caught. Soon, he was rehabilitated by a kind cop near a Jammu police station. Syed Hussain has been serving fresh sugarcane juice on a Rehari for which license was issued by Jammu Municipal Corporation (JMC). He has constructed a house and two shops in Belicharana as well. His accent is Bengali but he claims, he was born in Jammu. And after his parents died, he was brought up by a Sikh who took him to Iran for a business trip where the Sikh died and thereafter, Syed reached Bangladesh from where he crossed over to India, only to be detained by BSF and later, handed over to Jammu and Kashmir Police. Now this man is being linked to the entire Rohingya related controversy that seemingly right wing’s top priority. Jammu Chamber had gone to a new level threatening even to kill the refugees. Whether or not Syed is cooking-up a story, the J&K’s State Subject Commission (SSC) must find out. But he lacks any connection with refugees of Myanmar who are temporarily living in Jammu for last eight years. He was not part of Rohingya refugees. He has been living here for last 40 years. 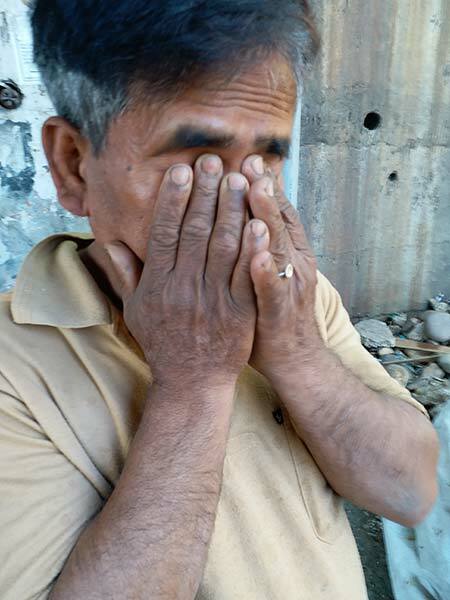 It is this man whose Aadhaar Card, State Subject certificate, Ration Card and Voter I-card led to section of Jammu’s civil society seek immediate deportation of Muslim refugees from Myanmar, who are living in temporary sheds across Jammu region. Interestingly, these documents were not recovered but were handed over by Syed and his family to Deputy Commissioner (DC) Jammu Simrandeep Singh who had gone to investigate them. Such was the importance attached to this case that instead of asking a Tehsildar or a Patwari to find out facts, Simrandeep personally drove along with his team to Syed’s residence. Singh’s close aide justified the action by his boss saying DC was unsure about Patwari or Tehsildar concerned belonging to a particular community giving him factual report. The moment, a local newspaper, “broke” the news of recovery of documents from a “Rohingya refugee”, Delhi media took-over and it added to chaos. But what is his story? DC Singh admitted having recovered six Aadhaar cards and state subject certificates from the Rohingyas but evaded details. Kashmir Life investigation suggested these six cards belong to Syed’s family. There was also a rumour that a Khidmat Centre located in Bhathindi was issuing Aadhaar cards to the Rohingyas, DC said they have not found any such centre. But the media reported a particular centre run by Zainab Khatoon Mir. “We are yet to have the system in-place for issuing Aaadhar cards because it requires biometrics,” Mir said. This newsman visited police stations at Narwal, Trikuta Nagar, Bhathindi, Belicharana, Bahu Fort, Gandhinagar and Ware House to find out whether they had found any Rohingya carrying Aadhaar card or any other document. Not even one police station replied in affirmation.